This is one of my favorite new patterns that we’ve recently added to our pattern collection at Yarnia. This version here is a full 400 yards long, which will wrap around the neck quite a few times, but if you prefer a shorter version, you may simply omit some pattern repeats and knit up a shorter version instead. You could easily decrease the yardage to 250, and still end up with a wonderfully cozy, ample-size cowl. The Lowbrow Cowl, worked up here in a deliciously soft and squishy blend of alpaca, merino, and regular wool. Come on in to the shop and we can get you set up with everything you need. 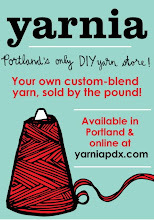 Or, if you don’t live in Portland, simply email us and we can get you squared away with the pattern, and any worsted weight yarn you’d like from our Online Shop!